Iraqi forces fighting ISIS seize key Ramadi position. A member of Iraqi security forces holds an Iraqi flag in Ramadi, Iraq, on Dec. 27, 2015. Iraqi forces have seized a government compound that ISIS had been using as a stronghold in its defense of the city of Ramadi, several outlets report. 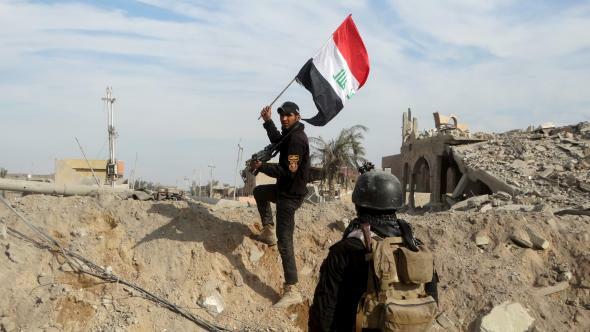 Initial accounts suggested that all of Ramadi had been retaken, but an Iraqi general has subsequently said that ISIS forces still occupy some 30 percent of the city’s area. Slate’s Joshua Keating wrote earlier this month that the potential retaking of Ramadi constituted a “glimmer of hope” in the Middle East, particularly given that operations there are largely being carried out by the actual Iraqi military rather than the Kurdish and Shia militia groups that the international coalition fighting ISIS (which is a Sunni group) has been forced to rely on in the general absence of competent Iraqi forces. ISIS still controls Iraq’s second-largest city, Mosul, as well as the city of Fallujah, which is less than 40 miles from Baghdad. 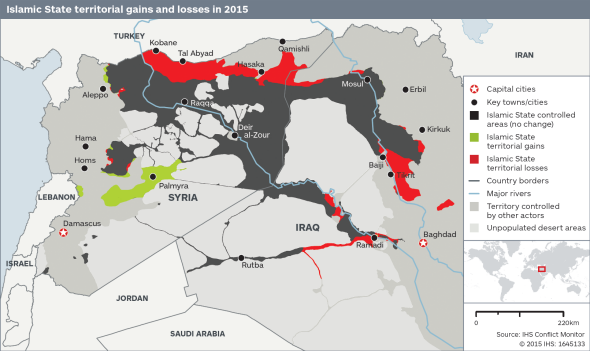 ISIS’s hold on Fallujah, though, will likely be weakened by the presumed loss of Ramadi’s effect on its supply lines.